Dozens of sold-out development conferences run every year on frontend, backend, devops, and related topics. Most of these conferences feature days of speakers giving lectures, tutorials, and general advice on new technologies. But not everyone has time or money to attend these conferences in person. That’s why YouTube is such a great alternative. Some conferences will record the live presentations and upload videos to YouTube for free. These vids take a bit of searching but if you know where to look you can find them. 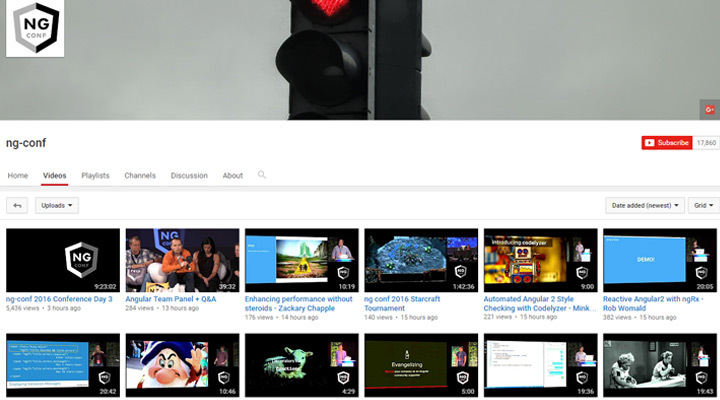 But for those who don’t want to dig through YouTube, I’ve curated some of the best channels for web developers. 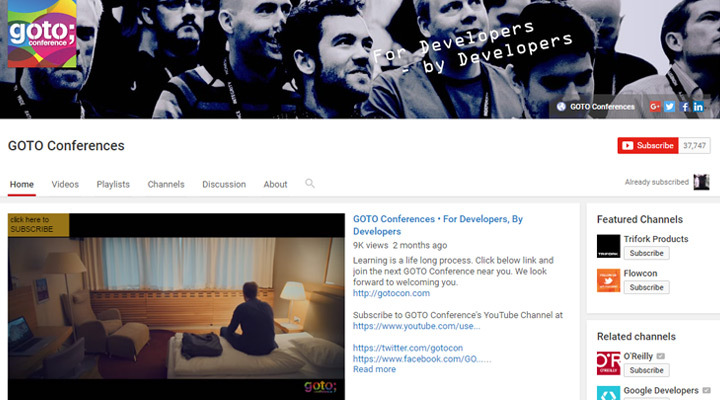 The first channel I’d recommend is dotConferences. 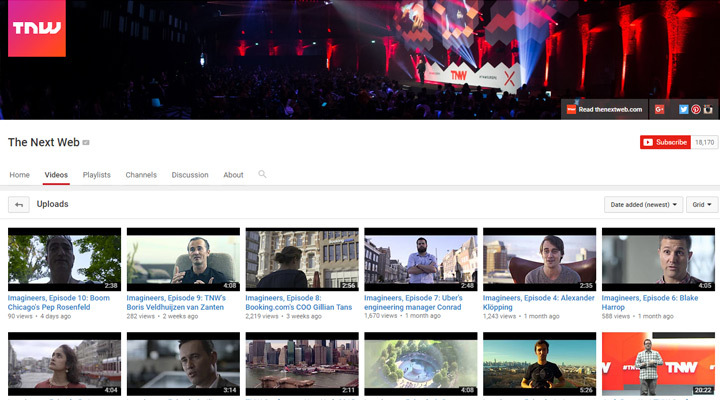 New videos are uploaded multiple times every year from many different conferences. Individual events focus on JS, CSS, Swift, and other tech topics. You can visit the dotConferences website to learn a little more about the network and the events. 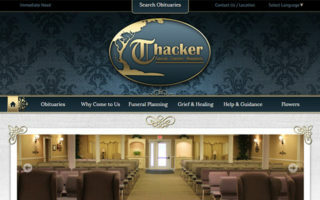 Their video recordings feature great quality in both video and audio. 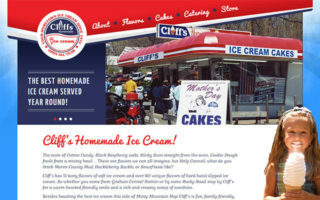 Topics cover such a wide variety of content that you’re bound to find something that you like. I give a big recommendation to this channel for any web developer looking for free keynotes & presentations. Another multi-event conference brand is GOTO Conferences with events all over the US and Europe. Talks are much more technical and encapsulate topics geared towards programmers. If you’re a complete beginner these talks may be a little too advanced. But it’s still possible to find beginner content on the channel if you take the time to look. Each video shows the speaker in part of the screen with their computer slides on another part of the screen. 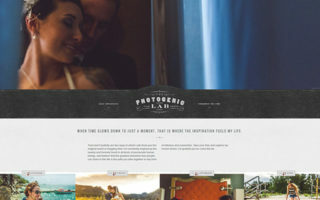 It’s a fantastic presentation method that really helps the viewer digest information. Most people already know about Google Tech Talks but I feel it still deserves a place in this list. 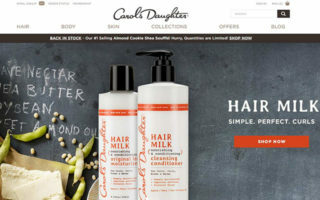 Their videos can drift away from the general topic of web development. But since most developers enjoy IT/tech subjects, many of these presentations are still quite valuable. Some vids are more analytical like the Netflix experiments talk. But you’ll also find more general talks like mocking the Internet. You really never know what you’ll find on this channel which makes it all the more exciting. 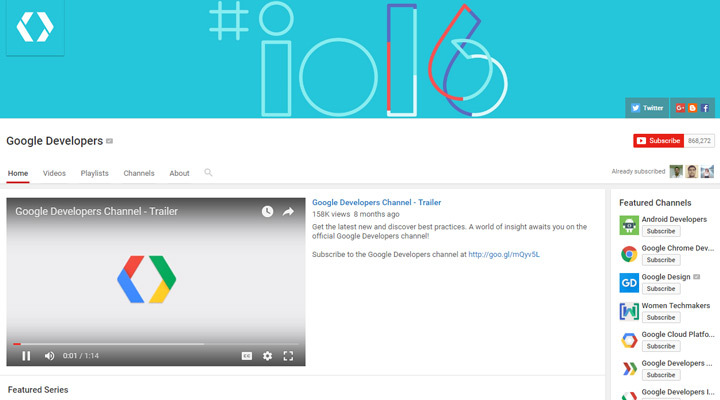 The Google Developers channel is different from tech talks because it’s geared towards people who write code. However not all the videos are talks, so it’s not exactly a conference-based channel. You will find plenty of informational videos of varying lengths, but there are conference talks too. So it’s really a mixed bag of great content for developers. And since this is powered by Google you know video quality is fantastic. 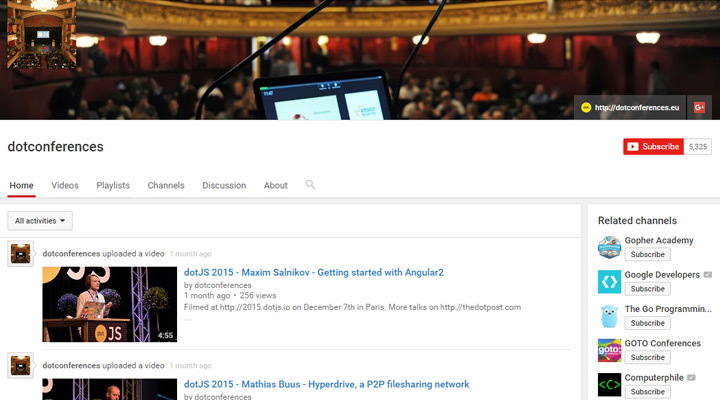 I mentioned the previous JSConf channel which curates talks from various sources. 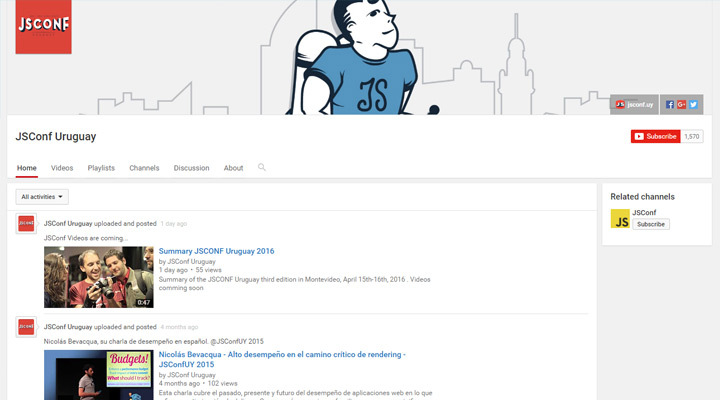 There’s also the JSConf Urugay page which is made for Spanish-speaking developers. However many of the talks are presented in English because many of the guest speakers only know English. 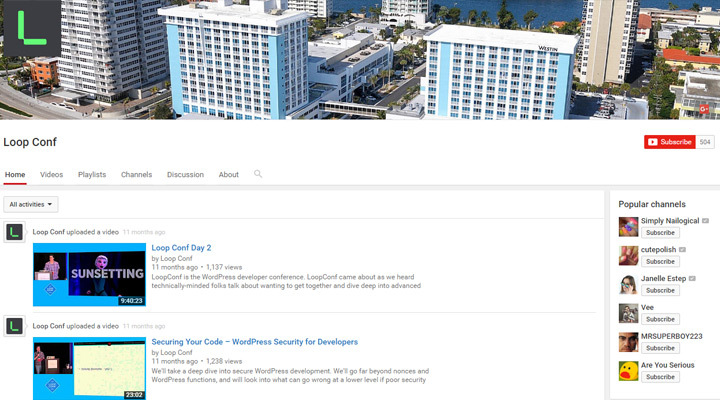 So if you enjoy the JSConf videos then you’ll like the JSConf Urugay channel too. In the Swiss city of Zürich the yearly Frontendconf Zürich takes place. And each year the event runners happily record all the best talks in full and upload the videos to YouTube. 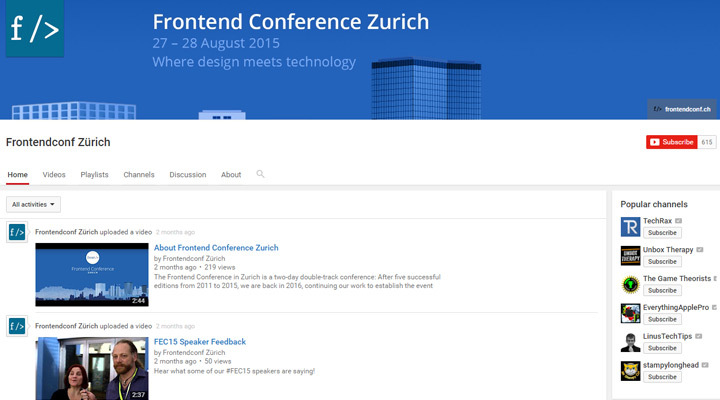 The Frontend Conf YouTube channel has dozens of talks, most of them 40+ minutes in length. You’ll also find small preview videos from each year’s conference that act like promos for ticket sales. From Business To Buttons is a very popular conference held in Sweden each year covering the business of marketing and UX design. 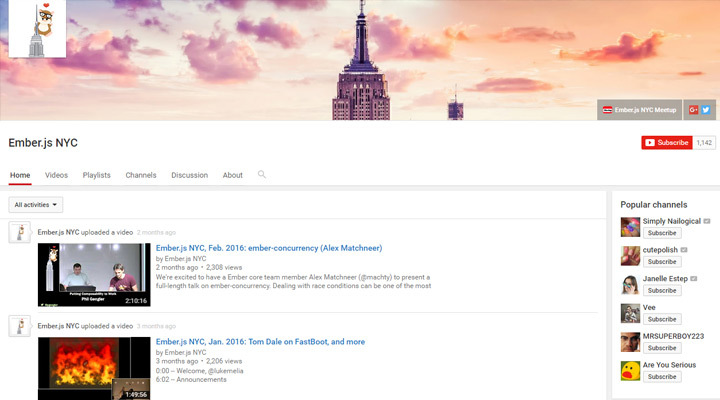 All the best videos are uploaded to this YouTube channel maintained by InUse, the organizer of Business to Buttons. Note that not all the conference videos are uploaded, and many of them are only 15-30 minutes long. But the subject matter is unique and may be perfect for curious developers. The capital city of denmark is home to the ColdFront Conference, a yearly front-end development event with some incredible speakers. 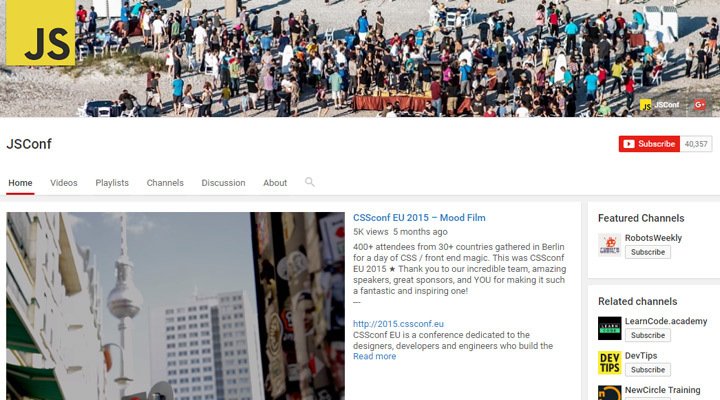 The channel is very new with only some talks uploaded from the 2015 event. But there’s already an event scheduled for this year and I’m looking forward to more great videos being added to the channel over time. Ember.js is a fast-growing open source MVC framework for web developers. The team hosts an official conference called Ember.js NYC and records all their videos to upload on YouTube for free. Whether you’re an Ember newbie or an experienced frontend developer, this channel is sure to have something for you. It’s one of the best channels to find quality Ember talks with most ranging 90-120 minutes long. The meteoric rise of Angular 2 has brought about many great conferences, one of which is ng-conf. This is the yearly event for Angular developers covering the ins-and-outs of the entire framework. Both new and experienced devs are learning Angular 2 which is a completely overhaul of the original Angular codebase. These ng-conf videos can make the whole learning process a lot easier. 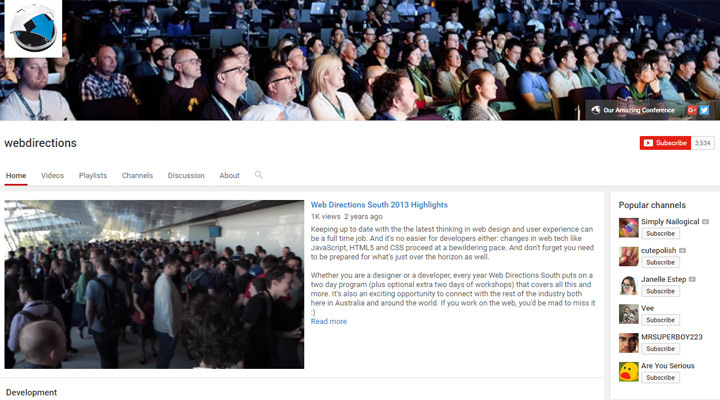 The Web Directions channel offers a big variety of cool stuff for web professionals. Most content is technical in nature, but you’ll find other talks that are more philosophical or marketing-oriented. Only a handful of videos are uploaded every year. But the channel has archives dating back 5+ years with great content. Videos range from 10-60 minutes and you never know what you’ll find. Dating back to early 2006 is The Next Web conference. Most people know TNW as an online tech news site, but the brand actually started as a conference and eventually grew into tech journalism. Multiple events are held every year with lengthy presentations about the Internet, coding, IT, marketing, and more. 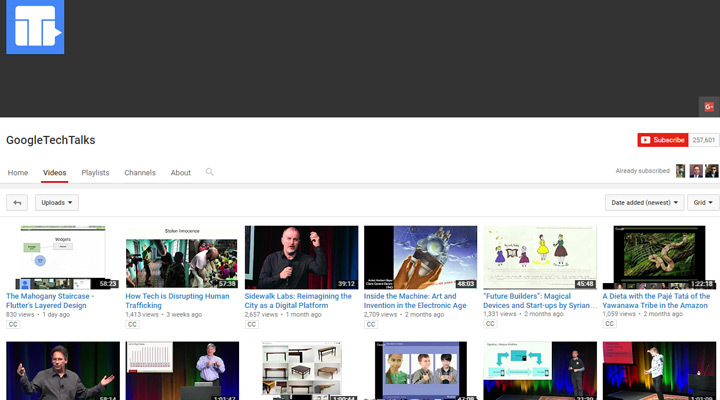 The video channel page is updated after each conference and it’s a treasure trove of high quality presentations. 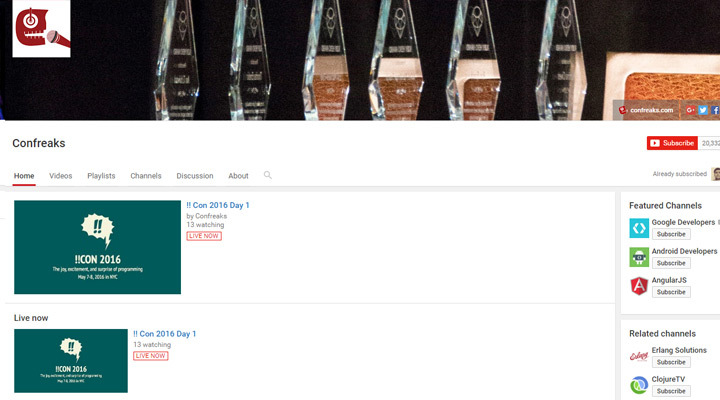 Everything you’ll find on the Confreaks channel is a mashup of different conferences over the course of a year. They have video recordings from Ruby on Ales, ElixirDaze, and ArrrrCamp among many others. At the time of writing this post the channel has over 3,000 videos and counting. Confreaks should be your go-to source for mixed video conferences about anything & everything programming. jQuery’s popularity is on the rise even in the face of powerful new frontend frameworks. Because of the incredible audience there’s lots of room for jQuery presentations about ES6, MVC architecture, and so much more. 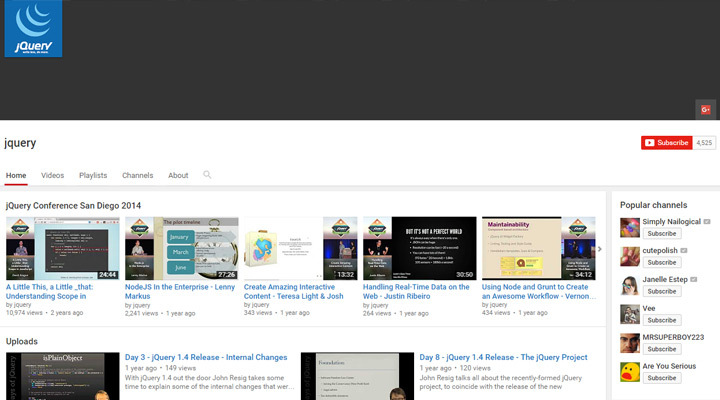 From what I can tell this is not the official jQuery YouTube channel. But it does feature 100+ different tutorials and talks about jQuery so it’s a great resource to learn more about the library. 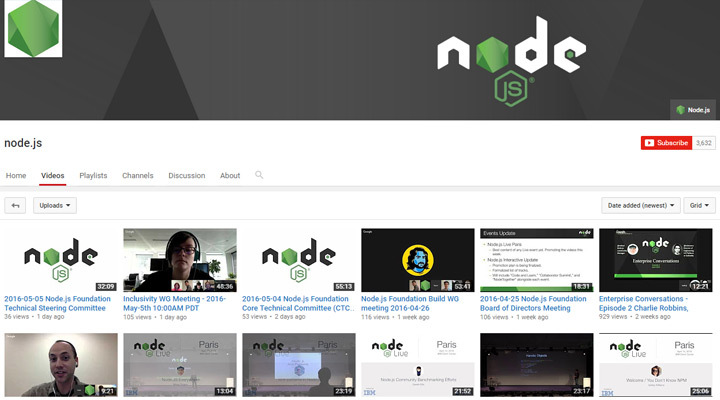 Another possible unofficial-yet-handy channel is this one for Node.js videos. Again they’re all free and many are uploaded from conference/event talks, although some are like podcasts or screencasts. I’ve yet to find an official Node.js channel so this may technically be the official source for Node videos. But even if it’s not, the owner does upload frequently and the vids are worth watching if you’re a NodeJS fan. Ft. Lauderdale is home to the new LoopConf event for WordPress development. This event has its own YouTube channel with free video recordings of each talk. So far I can only find one year’s worth of videos, but the LoopConf website has a planned event for this year too. I’m hoping each new year will see a flood of conference videos offering quality WordPress advice for developers of all skill levels. The definition of a polyglot is one who knows several languages. This is the idea behind PolyConf which uploads free videos from the conference each year. Topics include natural web languages and web APIs but also branch into Java and C++. 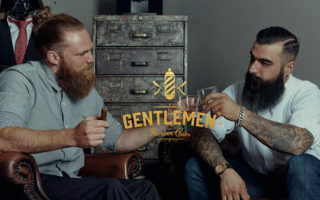 There’s a seemingly unlimited stream of great content added each year and a lot of the content is at a beginner’s level. 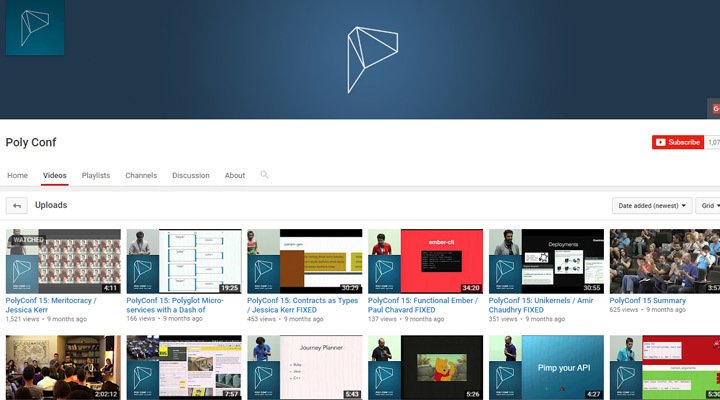 If you love programming and want to get started or expand your knowledge, then this is the channel to visit. You’ll expose yourself to dozens of topics you never knew existed and you’ll be learning all throughout the process. 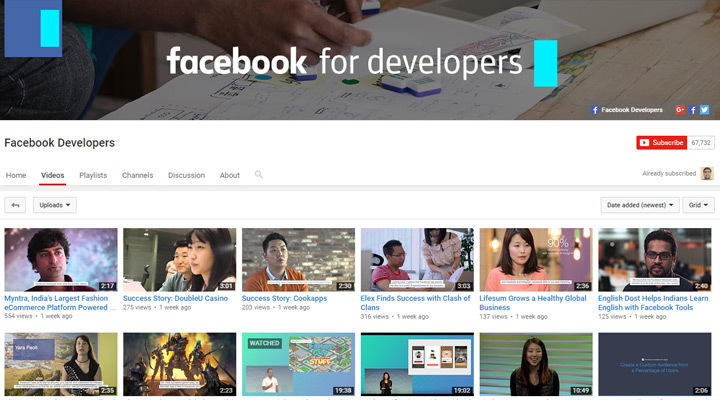 Everything on the Facebook Developer’s YouTube is at least tangentially related to building on Facebook’s API or one of their tools. 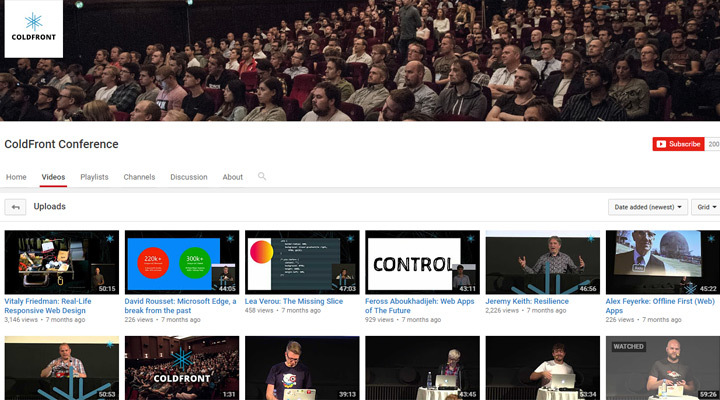 All of the best React.js Conf videos are uploaded to this channel completely free. But you’ll also find videos covering FB app analytics and other related products like RocksDB. Check it out if you’re a big React user, or if you frequently build on top of the Facebook platform. Anyone who taught themselves development should be familiar with O’Reilly. They’re a media company with a vast library of great programming books. 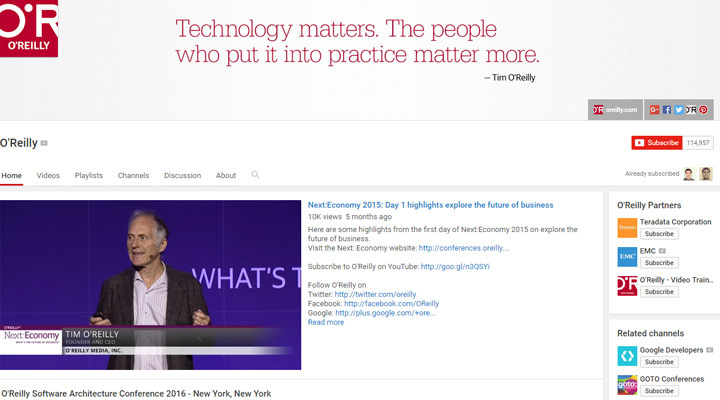 But O’Reilly also hosts conferences and talks with free videos added to their official YouTube channel. Some are rather lengthy but most appear to be under 10 minutes long—the perfect length for a quick digestible snippet when taking a break during the day. 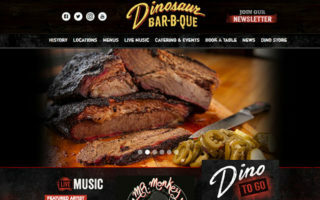 O’Reilly is a great company along with all the other channels listed in this post. I didn’t want to exclude anything awesome but I also wasn’t able to find as many examples as I wanted. And to wrap things up, here are some other conference YouTube channels that you might want to check out. These are much more specific so they have smaller audiences, but I feel they hold up to my barometer of quality recording and presentation content.